For the past 12 months, foodpanda Philippines turns 1 last June 6 and to celebrate its success, they are throwing a fun-filled party along with WeChat Philippines as they, too, launch the free rewards program, WeReward at URBN, Fort Strip, Bonifacio Global City. As what foodpanda Philippines CEO and Co-Founder Mauro Cocchieri said, “This is more of a thanksgiving night, to recognize all the hard work and dedication that everyone has bought into and for the company. foodpanda won’t be able to achieve this milestone without the men and women working day in and day out for the company”, that foodpanda’s success all boils down to excellent customer service. “This is also for all the hungry pandas who never fail to use foodpanda to satisfy their cravings. Without the customers who regularly use our service, we won’t be here. So big thanks to them”. Cocchiero also added in the one-year success of foodpanda Philippines, “It really has been a year of great things for foodpanda. From the immense growth in terms of customer usage and restaurant inventory, to City Delivery’s acquisition, to foodpanda being the market leader in the online food ordering and delivery industry, we are really thankful for all the support that everyone has shown us”. So what’s in store for foodpanda Philippines for the next coming years? “A better foodpanda is coming. Faster than ever, and, of course, choices. We are cooking up something for all of you, hungry pandas, so stay tuned”, Cocchieri finished. Known as WeReward, WeChat and foodpanda give back to users by rewarding them for completing simple daily tasks, such as making a short voice or video call on WeChat. Users are rewarded by accumulating WeChat points along the way, and using these to redeem awesome giveaways, discounts, and other benefits from partner merchants. From foodpanda, users get up to P300 worth of discounts via 100-peso food vouchers which can be used with select restaurants in Metro Manila and Cebu. The Php100 voucher has a minimum purchase of Php200, so imagine paying only half of your meal via WeReward. “This will have food lovers, and, of course, foodpanda users, posing with our delivery riders once their food is delivered. We want to create something that will go viral, and with food and social media, we are sure that we will get this out of the contest,” Julien Machal, foodpanda Philippines’ Head of Marketing said. 1. Customer must order on www.foodpanda.ph and take a selfie with the foodpanda rider or mascot. 2. Customer can choose from Facebook (facebook.com/foodpandaphilippines), Instagram (@foodpanda_ph) or WeChat (foodpanda). 3. Customer must follow and tag foodpanda's official Facebook and Instagram page. 4. For those who will use WeChat, they need to follow foodpanda Philippines' official WeChat account (foodpanda) and post their photo on their WeChat Moments. 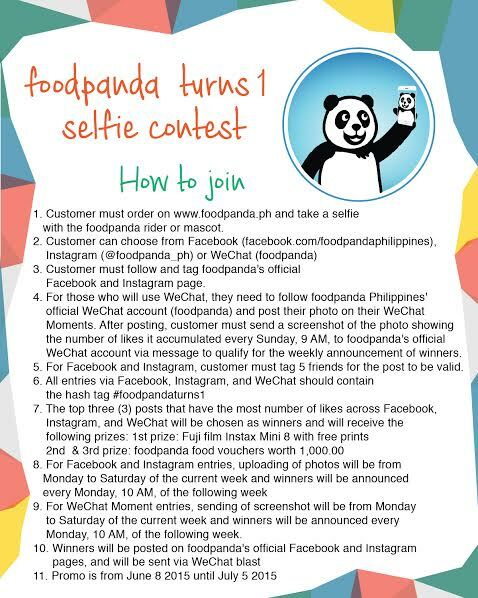 After posting, customer must send a screenshot of the photo showing the number of likes it accumulated every Sunday, 9 AM, to foodpanda's official WeChat account via message to qualify for the weekly announcement of winners. 5. For Facebook and Instagram, customer must tag 5 friends for the post to be valid. 6. 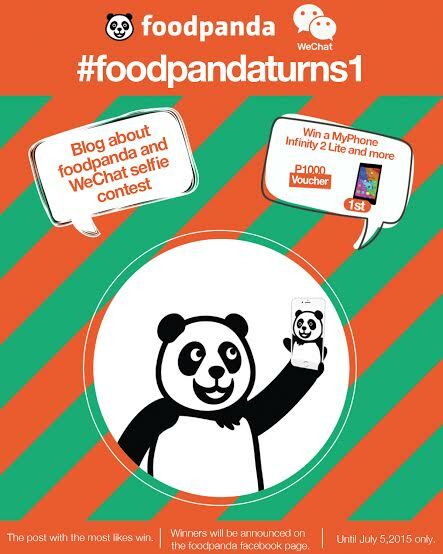 All entries via Facebook, Instagram, and WeChat should contain the hashtag #foodpandaturns1. 8. For Facebook and Instagram entries, uploading of photos will be from Monday to Saturday of the current week and winners will be announced every Monday, 10 AM, of the following week. 9. For WeChat Moment entries, sending of the screenshot will be from Monday to Saturday of the current week and winners will be announced every Monday, 10 AM, of the following week. 10. 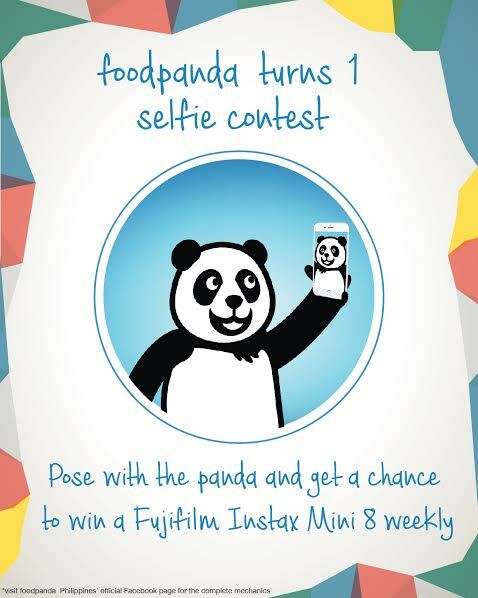 Winners will be posted on foodpanda's official Facebook and Instagram pages, and will be sent via WeChat blast.